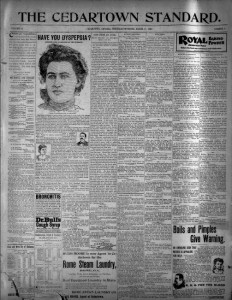 The North Georgia Historic Newspapers Archive now provides access to fifteen newspaper titles published in nine North Georgia cities (Canton, Cassville, Cedartown, Clayton, Cleveland, Dahlonega, Dalton, Gainesville, and Rome) from 1850 to 1928. Consisting of over 63,000 newspaper pages, the archive provides historical images that are both full-text searchable and can be browsed by date. The site is compatible with all current browsers and the newspaper page images can be viewed without the use of plug-ins or additional software downloads. The archive now includes the following North Georgia newspaper titles: Cassville Standard (1852-1860), Cedartown Advertiser (1879-1884), Cedartown Express (1877-1879), Cedartown Record (1874-1877), Cedartown Standard (1900-1922), Cherokee Advance (Canton) (1880-1922), Clayton Tribune (1899-1924), Cleveland Progress(1892-1896), and Dahlonega Nugget (1903-1928), in addition to the titles previously included in the archive: Gainesville News (1902-1922), Georgia Cracker (Gainesville) (1894-1902), North Georgia Citizen (Dalton) (1868-1921), Rome Courier (1850-1855), Rome Tri-Weekly Courier (1860-1880), and Rome Weekly Courier (1860-1878). The North Georgia Historic Newspapers Archive is a project of the Digital Library of Georgia, a part of Georgia’s Virtual Library GALILEO and is based at the University of Georgia. This is so exciting! I love researching newspaper archives. I am particularly pleased that DLG included the Dahlonega newspaper. My favorite neighbor, who had the same name as I do, was originally from Dahlonega and perhaps I can locate a newspaper article about her that she once showed me. She has long since passed away and it would be wonderful to see it again. Woohoo! This is exciting news! This will be great for those of us who do genealogy and have ancestors in North Georgia. Perhaps you could tell me the best place to look for newspapers for the Cedartown Georgia area from 1944 – 1994, any suggestions would be apprecicated. The Sara Hightower Regional Library Cedartown Branch has issues of the Cedartown Standard, the Cedartown Express, the Cedartown Advertiser, the Advance Courier, and the Iron City News, though the PINES catalog doesn’t clearly state the date range for their holdings. You might contact them via their contact form at http://cedartown.shrls.org/contact/ or by phone at 770-478-5644 to see if their holdings include your date range. The UGA Libraries has issues of the Daily Standard from Apr. 29, 1946-Jul. 7, 1950, the Polk County Times from Dec. 26, 1946-Jan. 7, 1954, and the Weekly Standard from Jan. 3, 1947-Jun. 9, 1950. You may be able to request these on interlibrary loan from your local library. Thanks for your interest in Georgia Historic Newspapers! recently saw a post in ‘forgotten habersham’ (facebook; georgia) that wondered about a news source called ‘the southern record.’ nobody in the group seems familiar with this source and wonder if it was a newspaper, magazine, or ?. any help would be most appreciated. thanks! There are two publications called The Southern Record, according to our research. The first is from Savannah, with a start date of March 25, 1927. The second is from Toccoa, with a start date of 1897. I have let our newspaper archivist know about these titles, so that he can add them to our list of materials that have been requested for digitization.